I am honored that Anna has invited me as a guest in IHOD, as I truly admire her talent and integrity in everything she shares. I am Marisol from Boutique No.1524, a little space created to curate beautiful details that would inspire me for ongoing design projects; while sharing with others in the process. I consider myself a modern/classic and I believe this reflects throughout my blog. Inspiration comes in different forms, but one of my favorites is within the 'collections' series; where I get to curate beautiful fashion and decor within a given category. Today I would like to share one of these collections which I hope becomes one of your summer musings! 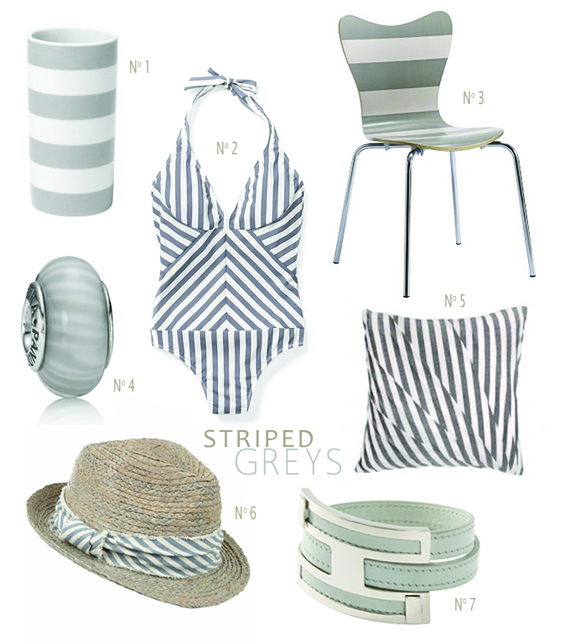 LOVE grey and stripes...The maillot and throw pillow are calling to me! Anna...love this..that hat is adorable. Well. I am a stripeaholic, so this post is my idea of heaven. Seriously loving all of these picks. And the shade? Also perfection. Heading over to check out her blog now! Beautiful gray stripes! I love that Stone Textile pillow. checking out the shop now. I love that throw pillow! I am currently in the market to make osme of my own! Gray tones & stripes are my weaknesses, so of course I want all of these picks! What a gorgeous round-up! I'm off to check out this blog. Love the mint green stripes! Hermes bracelet, someday, you will be mine! Oh! The pillow is my fave! Have to make some now!